Daytona, FL (Jan. 4, 2017) – 24-year-old sportscar driver Michael Johnson announced today that he will join JDC-Miller Motorsports for another season in the Continental Tire SportsCar Challenge. The paralyzed former motorcycle racing champion was unable to complete the entire 2016 season, because his specially-designed car wasn’t race-ready in time for the first two competitions. However, Johnson will be testing this week in Daytona at “The ROAR Before the Rolex 24.” This will be the first time the BMW driver has raced the 3.56-mile track. 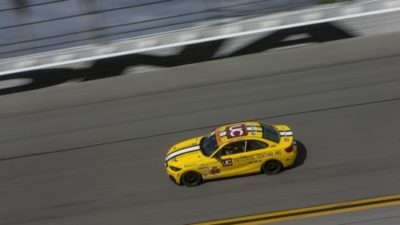 Johnson will be joined by teammate Stephen Simpson in kicking off the season in Daytona. Team owner John Church is confident in his drivers, as well. Johnson’s racecar will again be specialty-equipped with hand controls provided by GuidoSimplex. Due to Johnson being paralyzed from the waist down, his car has a complicated brake, gearshift, and throttle system, which are manipulated with his hands, instead of his feet. The 2017 Continental Tire Challenge season opens at Daytona International Speedway on Jan. 26, with the ‘Rolex 24 at Daytona’ weekend, which includes the annual, three-day ‘ROAR Before the Rolex 24’ test session beginning this Fri., Jan. 6, in Daytona Beach, Florida. The season will conclude Oct. 4, 2017, at Road Atlanta in Braselton, Georgia, which will complete a 10-race schedule. All of the 2017 CTSC races will be televised on a tape-delayed basis by FOX Sports, as well as streamed, live, on IMSA.com. In addition to primary backing from Universal Coating, Johnson’s racing efforts are also supported by: BraunAbility, freeM, Arai Helmets, Continental Tire and BMW. For more information, please visit www.MichaelJohnsonRacing.com.